The most daunting aspect of eating gluten-free is replacing baked items, and Betty Crocker offers a wide range of baked goods that are both delectable and gluten free. From bread, rolls, and pizza to muffins, donuts, cakes and pies. Including tips and techniques, and complete nutrition information with every recipe, this book will become the baking go-to resource for everyone who is eating gluten-free or baking for gluten-free friends and family. Included are tempting from-scratch recipes using homemade gluten-free flour mixes and commercial gluten-free flour. There are also recipes that use gluten-free mixes and refrigerated dough products to speed baking, making the book accessible for every type of baker. 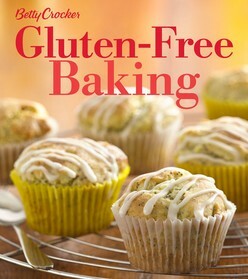 With Betty Crocker, baking gluten free is both delicious and easy. Betty Crocker presents delicious gluten-free recipes for all the baking greats: breads, pizza, cookies, cakes, cobblers, savory and sweet pies, pancakes and more.